The CHF grant “Identification of Idiopathic Epilepsy Genes in Australian Shepherds” for Dr. Ned E. Patterson, DVM PhD, University of Minnesota, should begin by January 1, 2012. The amount of this grant is $106,289. Please help us support this research by making a Year End donation for 2011 to Toby’s Foundation. All gifts are tax deductible to the fullest extent of the law. Please see below for information to donate on line or to mail in your donation. Thank you. Happy Holidays and a Healthy New Year to All! We are very thankful for your support and for all the clubs that have held fundraisers to help us. 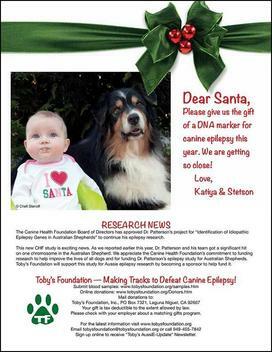 Our current Holiday ad “Dear Santa” features Stetson and Katiya in the Nov. / Dec. 2011 issue of the AS Journal and Aussie Times and on our website and facebook. Our Letters to Toby and Aussie Album have recently been updated with new letters and photos. Through the letters you will come to know these precious dogs. Some are still living with epilepsy and others have lost their lives because of this terrible disease. You will meet too the people who love them dearly and have fought for them everyday to have as much of a long and happy life as possible in spite of this disease. This disease is no respecter of age. Meet Stetson who “tells” his own story and recently turned 11 years old. Meet Ace who died just before he turned 9 years old. Robin writes about her beloved Ace in three letters spanning 6 years. Meet Ripper whose owner tried so hard to save him from the monster that is canine epilepsy. He died because of cluster seizures two months before his second birthday. Previously we mentioned Megan and the article about her “Never Forgotten” by Margaret Wilkinson and a letter and an ad for Cali, a shelter dog with epilepsy. Please visit our Letters to Toby to read some of these heartfelt and inspiring letters and visit our Aussie Album. If your dog has epilepsy and you would like to add a letter or photo please email it to us. This is a detailed account of living with epilepsy. Murphy also appears in our Letters to Toby and in our Aussie Album’s memorial pages on our website. Please read Murphy’s Diary. “I began keeping this record on the day of his first seizure, November 21, 1997.